Destroyer Hans Lody Z10. Hans Lody was one of the few destroyers to survive the war and was allocated to Great Britain. A low-angle weapon intended for surface action, this gun armed all of the German destroyers built before the start of World War II and a few war-built ones. There was also a twin mount planned for the never-built Type XI U-boats (U-Kreuzer). At least eight of these guns were exported to Greece for arming the destroyers of the Vasilevs Georgios class. Early guns were bored-out versions of the 10.5 cm/55 (4.1") SK C/28. The production guns were constructed of a loose barrel, jacket and breech end piece with a vertical sliding breech block. Some of these guns were still in service as of 2003 in coastal defense units in Norway. All German 12.7 cm guns had an actual bore diameter of 12.8 cm (5.04 in). ^This weapon was also planned for the Type 1938B Destroyers which never made it off the drawing board. 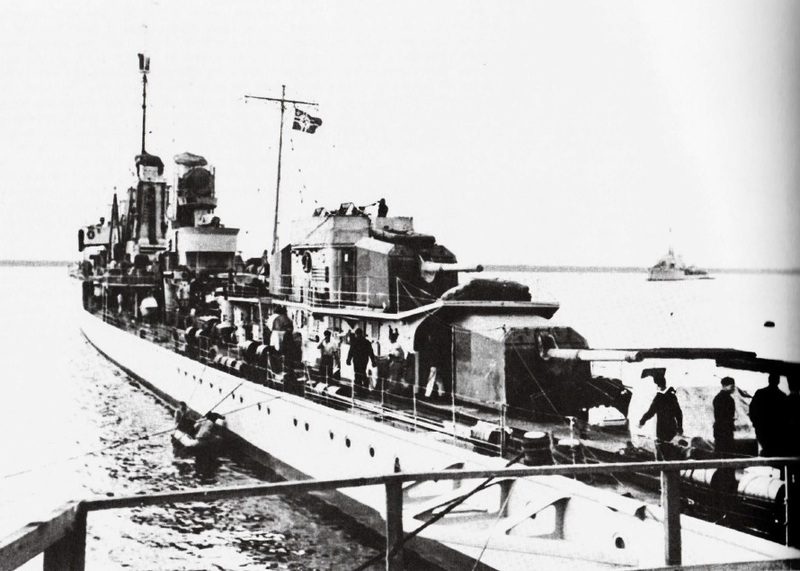 ^Guns designed for the Type XI U-Boats weighed 10,196 lbs. (4,625 kg) due to their increased breech end weights. ^The Type 24 torpedo boats Leopard and Luchs were used to test the prototypes of these weapons and had their 10.5 cm/55 guns replaced in 1932. Much information was gathered during these evaluations and the improved production version made its service debut in 1934. ^Converted 10.5 cm (4.1") SKC/28 guns weighed 7,848 lbs. (3,560 kg). ^This weapon was designed for a ROF of 18 - 20 rounds per minute, but the above figure was typical for well-trained crews. As these were open mounts, bad weather or Arctic conditions could greatly reduce the ROF. ^The sources below differ regarding the ammunition used for these weapons. For the most part, I have relied upon the data in M.Dv. Nr. 170,27 and in "German Destroyers of World War Two." ^Some sources including "Naval Weapons of World War Two" state that HE base fuze ammunition was supplied for these weapons, but this is not supported by M.Dv. Nr. 170,27 nor by "German Destroyers of World War Two." ^There were two versions of the HE L/4,4 nose fuze projectile, these having minor differences in the fuze packaging and very slight differences in the burster weight. ^HE nose fuze was also supplied with time fuzes for anti-aircraft purposes. These AA projectiles were the same as the standard HE Nose Fuze projectile, but did not use the ballistic cap (windshield). 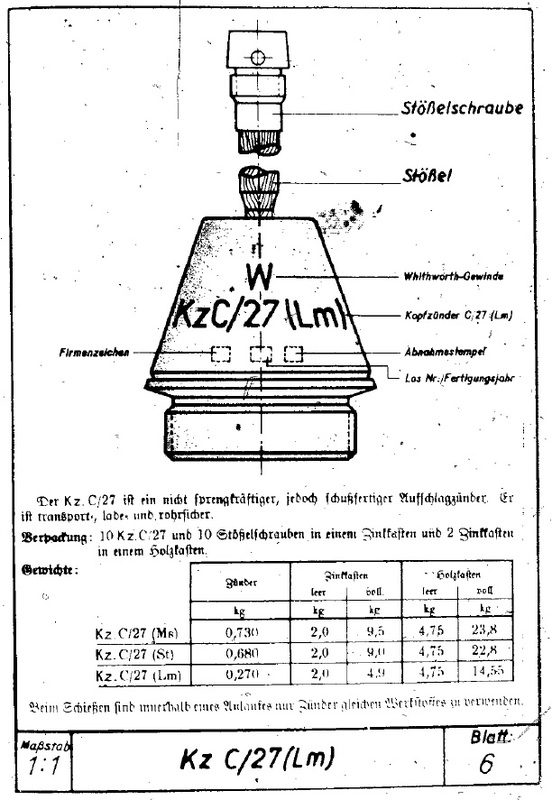 The 12.7 cm AA projectile was similar to that for the 15 cm/60 (5.9") SK C/25, see the sketch at the bottom of that datapage for details. The designation for these AA rounds was probably 12,7 cm Spgr. L/4,5 Kz (m.Hb) – Haube abgeschraubt - 12.7 cm HE Nose Fuze - Unscrewed [Ballistic] Cap. ^Outfits for destroyers were HE nose fuze with and without tracer and 80 illumination rounds per ship. Nose fuzed HE was 8.6crh. Exercise and practice rounds were produced for this weapon. Nammo Raufoss produced an anti-ship projectile (ASP M88) starting in 1989. This projectile had the same interior and external ballistics as the earlier German 12.7 cm rounds and was essentially a scaled up version of the ASP M85 used for former German 10.5 cm/45 (4.1") guns. The projectile weighed 61.7 lbs. (28.0 kg) and had a bursting charge of 7.0 lbs. (3.2 kg). German naval guns during World War II between 12.7 cm and 40.6 cm were issued HE Nose Fuze projectiles that had ballistic caps [Spgr. Kz (m.Hb)]. Similarly, older naval guns now used for Coastal Defense were issued new HE Base and Nose fuzed projectiles with ballistic caps [Spgr. Bdz u. Kz (m.Hb)]. As can be seen in the sketch below at left, these projectiles had the impact fuze located on the head of the projectile body, not on the head of the projectile. While this approach improved and simplified the connection between the fuze and the burster, this design had a weakness in that the ballistic cap actually "protected" the fuze when the shell made a glancing blow on the target instead of a direct hit. If the fuze was not crushed from this kind of hit, then the shell would not detonate. 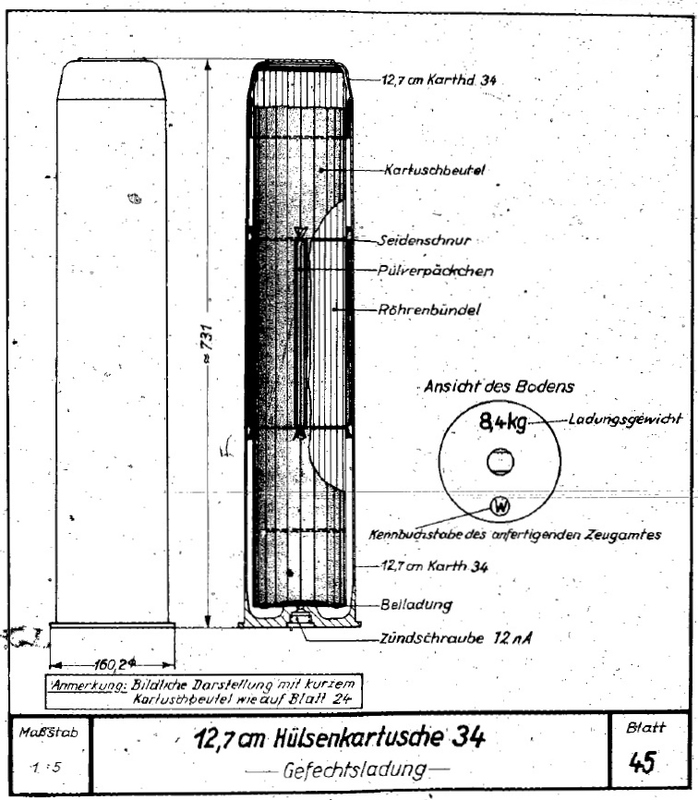 What the Germans did to improve the likelihood of detonation when the projectile made only a glancing hit was to insert a wooden rod, called the Stößel ("Ram") in these sketches, between the nose of the ballistic cap and the fuze. With this design, if the ballistic cap struck something hard enough to deform the cap, even if not a direct hit, then the rod would still be pushed into the fuze and initiate the detonation. Finally, in case of a highly oblique or "grazing" impact, the fuze was designed such that inertia would force the firing pin and primer holder together and still initiate the fuze detonation even if the rod was not pushed into the fuze. 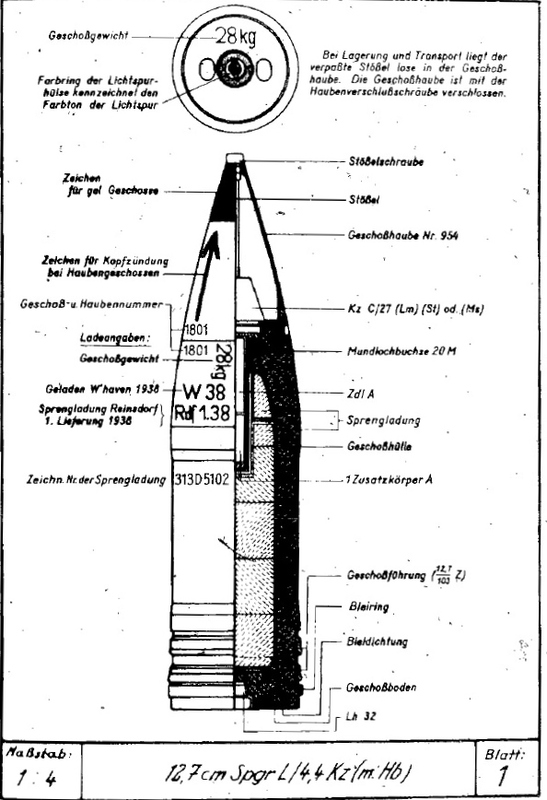 For most projectiles with ballistic caps, the Stößel was placed sideways inside the cap during storage and transport so as to prevent damage. 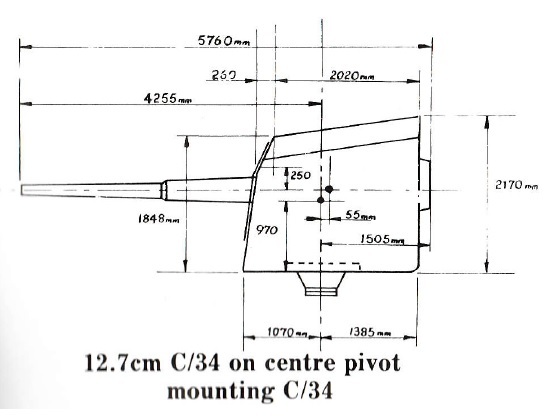 At least one projectile, the 24 cm Spgr. L/4,2 Bdz u. Kz (m.Hb) nA, was a later "New Art" design that did not need the Stößel moved from its ready position. 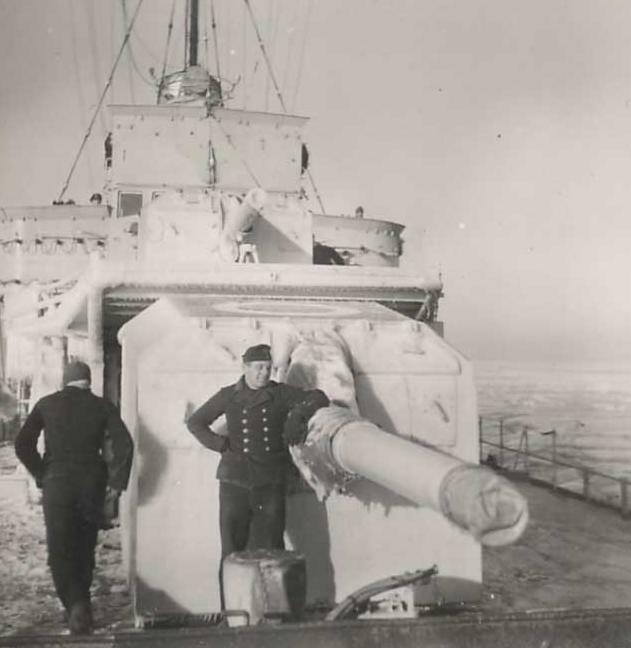 In regards to this German design, it should be noted that the 16" (40.6 cm) Mark I guns used on the HMS Nelson class battleships used similar HE projectiles with ballistic caps that had the fuze on the nose of the projectile body and not on the nose of the cap. However, unlike the German design, these lacked any connection between the fuze and the nose of the ballistic cap. HMS Rodney found during her bombardment of Oran in November 1942 that many of these projectiles failed to explode and they were withdrawn from service in 1943. A new HE projectile was issued later and this had a true nose fuze and was of better ballistic shape. 12.7 cm HE L/4,4 Nose Fuze with Ballistic Cap. Note that the Kz C/27 (Lm) nose fuze is inside the ballistic cap (windshield). Sketch from M.Dv. Nr. 170,27. Kz C/27 (Lm) Nose Fuse as mounted in the 12.7 cm HE L/4,4 and other HE Nose Fuze and HE Base and Nose Fuze projectiles with ballistic caps. The long rod (Stößel - "Ram") was made from wood and was intended to actuate the fuze in case of a glancing hit. The cap on top of the rod (Stößelschraube - "Ram screw") formed the nose of the shell and was used to insert and remove the rod. Sketch from M.Dv. Nr. 170,27. Stößel in the Storage and Transport condition. 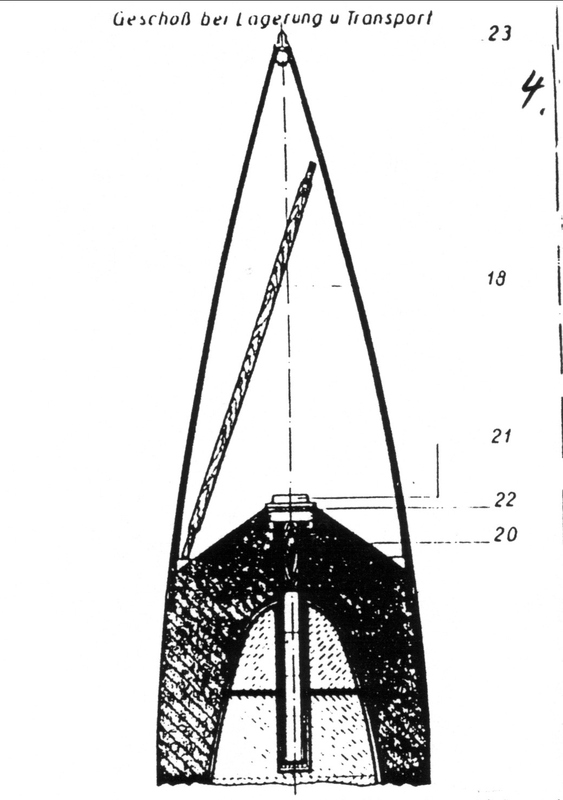 Detail of 30.5 cm HE Base and Nose fuze projectile from M.Dv. Nr. 190,1A1. ^The MPLC/28 mountings were converted from 10.5 cm mountings. ^The twin mount does not appear to have had the guns individually sleeved. Bow 12.7 cm/45 SK C/34 guns on unidentified Type 34 destroyer. Stern 12.7 cm/45 SK C/34 guns on an unidentified Type 34 destroyer. Diagram from "German Destroyers of World War Two" by M.J. Whitley. Main Charge (Hülsenkartusche) for 12.7 cm SK C/34 gun. Sketch from M.Dv. Nr. 190,4A1.